This article is about the North American sequel to Super Mario Bros. for the Nintendo Entertainment System. For other uses, see Super Mario Bros. 2 (disambiguation). Super Mario Bros. 2[a] is a platform game developed and published by Nintendo for the Nintendo Entertainment System. The game was first released in North America in October 1988, and in the PAL region the following year. The game was a commercial success, leading to its release in Japan for the Family Computer as Super Mario USA in 1992. It was remade as part of the Super Mario All-Stars collection, as well as in the form of Super Mario Advance for the Game Boy Advance handheld system. The original NES version and its remakes have all been re-released in later Nintendo platforms in some form or another. Super Mario Bros. 2 features some enemies and items from Yume Kōjō: Doki Doki Panic. The playable characters can now also pick up and throw enemies and objects at opponents to defeat them. The game consists of 20 different levels across the seven "worlds" comprising Subcon. Each world has three levels, except World 7, which has two. :6 Each world has a particular theme that dictates the obstacles and enemies encountered in its levels, such as desert areas with dangerous quicksand and snowy areas with slippery surfaces. Levels contain multiple sections or rooms that are connected via doors or ladders. Some rooms are accessible by entering certain jars. Magic potions found in each level are used to temporarily access "Sub-space", an inverted area where the player can collect coins and Mushrooms that increase the character's maximum health. In addition, certain jars, when entered in Sub-space, will warp the player to the later worlds, skipping levels altogether. 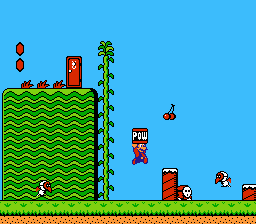 Other items available include cherries, which are collected in order to acquire a Starman; and the POW block, which can be used to quickly destroy all the enemies visible on the screen. :17–21 The player must defeat a boss enemy at the end of each of the first six worlds, then defeat Wart himself at the end of World 7 to complete the game. Mario has a dream of a staircase leading to a door to another world. A voice identifies the world as the dreamland of Subcon, and asks for Mario's help in defeating the villainous frog named Wart, a tyrant who has cursed Subcon and its people. Mario suddenly awakes and decides to tell Luigi, Toad and Princess Peach, who all report experiencing the same dream. The group decides to go on a picnic, but upon arriving, they discover a cave with a long staircase. Through a door at the top, the group are transported to Subcon, revealing their dreams to have been real. After defeating Wart, the people of Subcon are freed and the group celebrates, but Mario suddenly awakes in his bed, unsure if the events that took place were real or just a dream. Nintendo originally released a different game called Super Mario Bros. 2 on Japan's Family Computer Disk System in 1986. Its engine is that of an enhanced Super Mario Bros., with the same basic game format but adding more complex level designs, character features, and weather features. Some of the advanced level content had been culled from Vs. Super Mario Bros, a coin-operated arcade version of the original Super Mario Bros. for NES. :2 All of these factors combined to yield an incremental game design with significantly higher difficulty. What was to eventually become this new game had originated as a prototype developed and directed by Kensuke Tanabe and implemented by Nintendo's frequent programming partner, SRD. Its gameplay emphasized vertically scrolling levels with two players cooperatively tossing items to each other, ascending by way of throwing and stacking blocks. However, the prototypical implementation of this scrolling and multi-player action game was deemed to exceed the physical capability of Nintendo's consumer hardware at the time, and the gameplay was ultimately considered lacking. The idea was that you would have people vertically ascending, and you would have items and blocks that you could pile up to go higher, or you could grab your friend that you were playing with and throw them to try and continue to ascend ... the vertical-scrolling gimmick wasn't enough to get us interesting gameplay. —Kensuke Tanabe on the gameplay mechanics that would later be used for Yume Kōjō: Doki Doki Panic and Super Mario Bros. 2. Unwilling to compromise on gameplay, Tanabe suspended development of the prototype until eventually receiving instruction to use the Yume Kōjō mascots in a game. In collaboration with Shigeru Miyamoto's team, they greatly expanded the gameplay and developed Yume Kōjō: Doki Doki Panic for the Family Computer Disk System, released in Japan on July 10, 1987. The title Yume Kōjō: Doki Doki Panic[b] is derived from "doki doki", a Japanese onomatopoeia for the sound of a quickly-beating heart. The game's title and character concept were inspired by a license cooperation between Nintendo and Fuji Television to promote the broadcaster's Yume Kōjō '87 event, which showcased several of their latest TV shows and other products at the time. The Yume Kōjō festival's mascots became the game's protagonists, a family consisting of the boy Imajin, his girlfriend Lina, and his parents Mama and Papa. The rest of the game's characters, including the main villain named Mamu, were created by Nintendo for the project. Yume Kōjō: Doki Doki Panic takes place within a book with an Arabian setting. All four characters are optionally playable, though the game is not fully completed until the player clears all levels using each protagonist. For the American conversion into Super Mario Bros. 2, many graphical changes were made to the look, animation, and identity of the scenery and characters. The character likenesses of Mario, Luigi, Princess Toadstool, and Toad were built upon their respective counterpart models of Imajin, Mama, Lina, and Papa. This marked the first time that Mario and Luigi had noticeably different heights, and Miyamoto originated the "fluttering" animation of Luigi's legs, to justify the enhanced jumping ability seen in the corresponding Mama character. Yume Kōjō: Doki Doki Panic needed only a few alterations for its conversion into the Mario series because it had already contained familiar features: Starmen, sound effects for coins and jumping, POW blocks, warp zones, and a soundtrack composed by original Super Mario Bros. composer Koji Kondo. To reduce the game's overall difficulty, the designers made minor technical changes. They opted not to retain Yume Kōjō: Doki Doki Panic's ultimate requirement to complete each level using each protagonist; therefore, this new Super Mario Bros. 2 can be completed in only one pass by any combination of characters. And in the tradition of the Mario series, they added the ability to run by holding the B button. 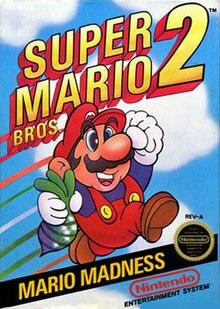 This Western version of Super Mario Bros. 2 was such a success that it was eventually released in Japan in 1992 under the title Super Mario USA. Likewise, Nintendo later released the Japanese Super Mario Bros. 2 in America in the form of Super Mario Bros.: The Lost Levels, a part of the re-release compilation Super Mario All-Stars on the Super NES. Nintendo has continued to release both games, each with the title of Super Mario Bros 2. in their respective regions, including a Virtual Console release and a Wii re-release of Super Mario All-Stars. In 1993, Nintendo released an enhanced Super Nintendo Entertainment System compilation titled Super Mario All-Stars. It includes the Super Mario Bros. games released for the Famicom/NES. The version of Super Mario Bros. 2 included in the compilation has improved graphics and sound to match the Super NES's 16-bit capabilities, as well as minor alterations in some collision mechanics. It is possible to change the character after losing a single life, while the original version allows changing it only after completing a level or when the player loses all their lives and chooses "Continue", making the game more forgiving when choosing a character not adept at some specific level. The player begins with five lives instead of three, and the slot game gains an additional bonus: if the player obtains three sevens, the player wins 10 lives. In March–April 1996, Nintendo collaborated with the St.GIGA satellite radio station to release an ura or gaiden version of the game for the Satellaview system, featuring 16-bit audiovisual enhancements similar to that of Super Mario All-Stars. This game is titled BS Super Mario USA Power Challenge (ＢＳスーパーマリオＵＳＡ パワーチャレンジ, Bī Essu Sūpā Mario USA Pawā Charenji), and like all Satellaview titles, it was released episodically in a number of weekly volumes. BS Super Mario USA Power Challenge was not released outside of Japan and as with all other Satellaview titles it has not been rereleased as a stand-alone title. The game exists today solely in ROM format and is traded online by Satellaview emulation enthusiasts. The game made use of "SoundLink" narration (radio drama-style streaming voice data intended to guide players through the game and give helpful hints and advice) and broadcast CD-quality music. Due to the nature of SoundLink broadcasts these games were only broadcast to players between 6:00 and 7:00PM on broadcast dates, at which times players could download the game from the Events Plaza on the BS-X application cartridge. A single rerun of the broadcasts was conducted in the same weekly format from June 3, 1996 to June 29, 1996 at 5:00 to 6:00PM. The BS-X download location for the rerun changed to Bagupotamia Temple. While the underlying gameplay itself is largely similar, new and arranged content has been added. For instance, the BS version newly featured a score counter. Furthermore, at the beginning of the game Mario is the only playable character. Later in the game, time-dependent events occur triggering, among other things, the possibility of using other characters. Another feature unique to the game is the inclusion of gold Mario statues (ten in total for each chapter) that are hidden in various locations (including Sub-Space). Collection of the statues in-game grants the player an extra life and refills the life meter. After clearing a level, the player could press "Select" to see some statistics such as the number of statues, coins, cherries, and mushrooms collected, as well as display which bosses had been defeated. On March 21, 2001, Super Mario Bros. 2 received another release, based on the All-Stars remake, as part of Super Mario Advance, which also contains a remake of Mario Bros.. Super Mario Advance was developed by Nintendo Entertainment Analysis and Development, and was a launch title for the Game Boy Advance. The Super Mario Advance version of Super Mario Bros. 2 includes several new features such the addition of the enemy Robirdo, a robotic Birdo, replacing Mouser as the boss of World 3; the addition of the Yoshi Challenge, in which players may revisit stages to search for Yoshi Eggs; and a new point-scoring system, similar to that used in the aforementioned BS Super Mario USA Power Challenge. Graphical and audio enhancements appear in the form of enlarged sprites, multiple hit combos, digital voice acting, and such minor stylistic and aesthetic changes as an altered default health-meter level, boss-order, backgrounds, the size of hearts, Princess Toadstool being renamed to the now-standard "Princess Peach", and the inclusion of a chime to announce Stars. The game was released for the Wii U Virtual Console on July 16, 2014, in Japan and later in North America on November 6, 2014. Super Mario Advance received a "Gold" sales award from the Entertainment and Leisure Software Publishers Association (ELSPA), indicating sales of at least 200,000 copies in the United Kingdom. Super Mario Bros. 2 yielded ten million copies sold and was the third highest-selling game ever released on the Nintendo Entertainment System at that time. Nintendo Power listed Super Mario Bros. 2 as the eighth best Nintendo Entertainment System video game, mentioning that regardless of its predecessor not being a Mario game, it was able to stand on its own merits and its unique takes on the series' signature format. Super Mario Bros. 2 was ranked 108th out of 200 of the "Greatest Games of Their Time" by Electronic Gaming Monthly. GamesRadar ranked it the 6th best NES game ever made. The staff complimented it and other 8-bit games for being a greater improvement than sequels around 2012, which they thought had seen only small improvements. Entertainment Weekly picked the game as the #6 greatest game available in 1991, saying: "The second and still the best of the Super Mario series". When it was rereleased in 2001 as Super Mario Advance it received generally positive reviews, garnering an aggregate score of 84% on Metacritic. One reviewer concluded "all nostalgia and historical influence aside, Super Mario Bros. 2 is still a game worth playing on the merits of its gameplay alone", also saying that "the only reason you may not want to pick it up is if ... you already own it in another form". However, GameSpot thought that Super Mario Bros. 3 or Super Mario World would have been a better choice for a launch game considering their respective popularity; both titles were eventually also remade as part of the Super Mario Advance series. Conversely, IGN praised the choice, calling it "one of the most polished and creative platformers of the era". The game was named one of the NES best games ever by IGN, saying that the game offers greater diversity in graphics and gameplay than the original, making it a great bridge game between the other NES Mario titles. ScrewAttack named Wart's battle theme in a list of the top ten best 8-Bit Final Boss Themes. Many elements in Super Mario Bros. 2 have endured in subsequent sequels and in related series. The game added the ability to lift and toss enemies and objects—a defining feature of its earliest prototype—which has become part of the permanent repertoire of the Mario series. The ability appears in Super Mario Bros. 3, Donkey Kong (Game Boy), Super Mario World, Super Mario Land 2: 6 Golden Coins, Super Mario 64, Super Mario Sunshine, Mario vs. Donkey Kong, Super Mario 64 DS, New Super Mario Bros., Super Paper Mario, New Super Mario Bros. Wii, Super Mario Galaxy, Super Mario Galaxy 2, New Super Mario Bros. U, and Super Mario 3D World. The Wii U game Super Mario 3D World features the same playable characters with the same basic physical abilities from Super Mario Bros. 2. The New Super Mario Bros. series also includes elements and ideas originally proposed for the prototype of this game. The multi-player elements originally proposed, were finally realized in the Wii game, where up to four players can play competitively or co-operatively. This gameplay incorporates the competitive elements from the original Mario Bros., with the platforming of Super Mario Bros. Vertical scrolling multiplayer levels are frequent in this game and also the other games in the series that followed after the Wii release. Many characters of Super Mario Bros. 2 have been assimilated into the greater Mario universe as well, such as Birdo, Pokeys, Bob-ombs, and Shy Guys. This is the first game in which Princess Toadstool and Toad are featured as playable characters. Princess Peach eventually starred in other Mario games such as Super Princess Peach. Toad has received supporting roles in later Mario games and has starred in games like Wario's Woods, New Super Mario Bros. Wii, and Captain Toad: Treasure Tracker. Super Mario Bros. 2 is the first game where Luigi received the physical appearance he has today, especially being taller than Mario. In the Super Smash Bros. series, Peach has the ability to pluck and throw vegetables, and to float. Super Smash Bros. Melee has a stage called Mushroom Kingdom II, which is based on Super Mario Bros. 2, though the visuals are more similar to the version seen in Super Mario All-Stars. The stage also has characters in their 2D sprite form, including Pidgit and Birdo. Super Smash Bros. for Nintendo 3DS and Wii U feature Luigi's fluttering feet when jumping, and red grass that can be plucked to reveal items. The 1989 cartoon television series The Super Mario Bros. Super Show! incorporates characters, settings, and music from Super Mario Bros. 2. ^ Nintendo Power 2010 calendar. Nintendo Power. Nintendo. 2009. ^ a b c d e f g "The Secret History of Super Mario Bros. 2". wired.com. April 3, 2011. Retrieved April 3, 2011. ^ a b c d e McLaughlin, Rus (September 14, 2010). "IGN Presents The History of Super Mario Bros". IGN. Retrieved April 9, 2014. ^ a b c d e f Super Mario Bros. 2 (U) instruction manual (First ed.). America: Nintendo of America Inc. 1988. ^ Tanabe, Kensuke (May 18, 2004). "Interview - Kensuke Tanabe Talks Metroid Prime 2: Echoes" (Interview). Interviewed by Jonathan Metts; Daniel Bloodworth; Matt Cassamassina. Nintendo World Report. Archived from the original on November 5, 2013. Retrieved January 11, 2014. ^ "クリエイターズファイル 第101回". Gpara.com. February 10, 2003. Retrieved January 11, 2011. ^ Mike (January 24, 2003). "Doki Doki Panic: The strange truth behind Super Mario Bros. 2". Progressive Boink. Archived from the original on June 22, 2007. Retrieved February 8, 2015. ^ "From Doki Doki Panic to Super Mario Bros. 2". The Mushroom Kingdom. Retrieved August 1, 2014. ^ "Konno discusses how Luigi got his infamous leg flutter jump". GoNintendo. Retrieved June 18, 2013. ^ Nintendo Entertainment Analysis and Development (July 10, 1987). Yume Kōjō: Doki Doki Panic. Nintendo. Scene: staff credits. ^ Nintendo Sound Selection vol.3 Luigi: B-Side Music (Media notes). Scitron Digital Contents Inc. 2005. ^ a b c d Kameb (February 12, 2008). スーパーファミコンアワー番組表 (in Japanese). The Satellaview History Museum. Archived from the original on May 1, 2012. Retrieved March 29, 2009. ^ a b c d Andou, N. スーパーファミコン　タイトル (in Japanese). Famicom House. Archived from the original on January 27, 2012. Retrieved March 10, 2008. ^ "Joining Nintendo After Super Mario". Iwata Asks: Super Mario Bros. 25th Anniversary. Nintendo of America, Inc. September 13, 2010. Retrieved January 19, 2011. ^ a b "Super Mario Bros. 2: Super Mario Advance - Game Boy Advance Review at IGN". IGN. Retrieved February 26, 2010. ^ "Super Mario Advance Wii U Virtual Console footage (Japan)". Nintendo Everything. July 15, 2014. Retrieved July 16, 2014. ^ Miller, Skyler. "Super Mario Bros 2 – Overview". Allgame. Archived from the original on November 14, 2014. Retrieved May 5, 2015. ^ Navarro, Alex. "Super Mario Bros 2 Review". GameSpot. Archived from the original on May 20, 2013. Retrieved December 6, 2012. ^ "Super Mario Bros. 2 Review". IGN. IGN Entertainment, Inc. July 5, 2007. Retrieved August 25, 2009. ^ Thomas, Lucas M. (July 5, 2007). "Super Mario Bros. 2 Review". IGN. Retrieved April 19, 2018. ^ "All Time Top 20 Best Selling Games". May 21, 2003. Archived from the original on February 21, 2006. Retrieved December 1, 2006. ^ "NP Top 200". 231. Nintendo Power. August 2008: 71. ^ Strauss, Bob (November 22, 2018). "Video Games Guide". Entertainment Weekly. Retrieved November 3, 2018. ^ "Super Mario Advance (gba) reviews at". Metacritic.com. June 11, 2001. Retrieved July 20, 2009. ^ a b c d e "Super Mario Bros. 2 Review". IGN. IGN Entertainment, Inc. July 5, 2007. Retrieved August 25, 2009. ^ "Super Mario Advance for the Game Boy Advance review". GameSpot. Retrieved February 26, 2010. ^ "18. Super Mario Bros. 2". IGN. June 11, 2001. Retrieved April 10, 2010. ^ "ScrewAttack - Top Ten 8-Bit Boss Themes". ScrewAttack's Top 10. ScrewAttack. Archived from the original on January 5, 2012. Retrieved April 11, 2010. ^ "Mario's Basic Moves". Nintendo Power: Strategy Guide. Nintendo. SG1 (13): 4. 1990. ^ Miller, Skyler. "Super Mario World - Review". Allgame. Retrieved July 13, 2009.